I had big expectations for Camelot Burning. 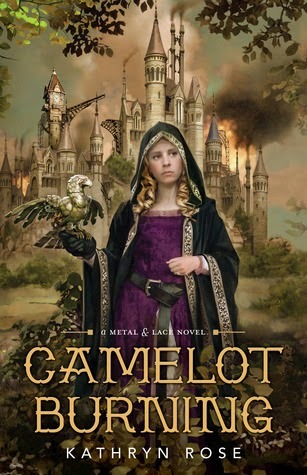 I was so excited that there was finally a book that combines Arthurian legends and steampunk. And aside from a few minor problems, I was impressed by this solid debut. I really only had two issues: the romance, and the pacing. There actually wasn't anything specific I disliked about the romance - there wasn't really any insta-love or anything like that. I just never felt the chemistry between Vivienne and Marcus and found it hard to care for Marcus's character. He didn't have enough development for me to understand why Vivienne was falling for him. But the romance doesn't play a huge part in the story, so it wasn't a big problem for me. What really bothered me was the pacing. It was so slow! It felt loaded down with unnecessary descriptions that made it super easy to lose focus on the story. Also, it seemed like Vivienne conveniently overheard important conversations or details when, in real life, it seems rather unlikely that she could do so while going unnoticed. Aside from those issues, Camelot Burning was a fun read. I loved the plot. It stays somewhat true to the original story, but the author explores lots of new directions and subplots that surprised me. She creatively combines the steampunk and medieval worlds into one with lots of smart details and world-building. The heroine, Vivienne, is awesome. I like how she's so levelheaded and reasonable, and she calmly helps out in whatever way she can. I also enjoyed Merlin's role as her mentor. You never know what he's going to do next - he's full of secrets! - and I loved all his scenes. Minor characters like Vivienne's mother, Guinevere, and Lancelot added the perfect touch to the story. I had some problems with the pacing and romance, but otherwise I enjoyed this. The author does a great job of putting her own twist on the story, and the heroine is strong and likeable. If, like me, you're a fan of the TV show Merlin, then this book is just what you're looking for. I'm definitely going to be checking out the next book in this series.